Address correspondence and reprints request to: Nara,yanan Kutty, FRCPCHUK, Senior Consultant, Department of Child Health, Sultan Qaboos Hospital, Salalah, Sultanate of Oman. 1Occupational Health Adviser, British Petroleum. Address correspondence and reprints request to: Faisal Rabia Al-Rubaee, Occupational Health Adviser, British Petroleum. Objectives: The aim of this paper is to describe the epidemiology of occupational injuries in the Harweel oil field, Oman. Methods: The study is based on data gathered from a computerized database maintained by Petroleum Development of Oman (PDO). All non-fatal work-related occupational injuries registered between April 2007 and December 2009 were gathered and analyzed. Results: A total of 170 work-related injuries were reported during the study period. Foreign body to the eye was the most common type of injury (27.6%) encountered among all injuries, followed by man falls/slips (11.8%). Injury to the upper extremities accounted for the largest percentage (38.8%) among other body parts. While, a significant portion of the injuries (52%) affected workers aged less than 30 years. The average injury rate per 1000 exposed workers per year was 19.8. 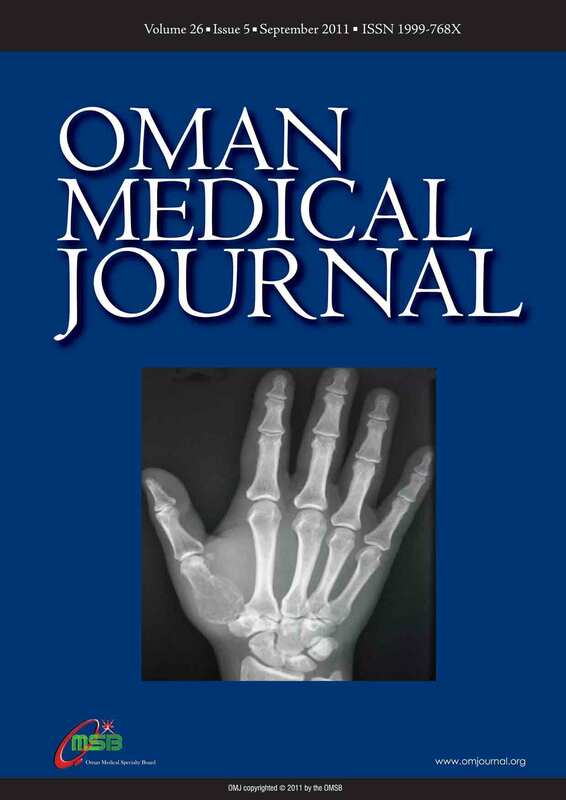 Conclusion: The study outlines the types of injuries most commonly encountered in the oil field in Oman. Additional data is required in order to devise proper epidemiological analysis. Establishing a comprehensive surveillance system for injuries is essential to ascertain factors influencing such injuries. 1*Department of Zoology. Gurudas College, Narkeldanga, Kolkata-700054, India. 1Department of Microbiology, Bacteriology and Serology Unit, Calcutta School of Tropical Medicine, C. R. Avenue, Kolkata-700073, India. 2Department of Physiology and Biophysics, KPC Medical College and Hospital, 1F Raja S. C. Mallick Road, Jadavpur, Kolkata-700032, India. Address correspondence and reprints request to: Dr. Shyamapada Mandal, Department of Zoology. Gurudas College, Narkeldanga, Kolkata-700054, India. Objective: To explore the in vitro antibacterial activity of ethanolic extracts of cinnamon (Cinnamomum zeylanicum; CIN), clove (Syzygium aromaticum, CLV) and cumin (Cuminum cyminum, CMN) against clinical isolates of methicillin resistant Staphylococcus aureus (MRSA), from Kolkata, India. Methods: The CIN, CLV and CMN were tested for their antibacterial activity against MRSA by in vitro methods. Minimum inhibitory concentration (MIC) values of the three extracts were determined, and time-kill studies were performed in order to investigate the bactericidal activity of the extracts (at the MIC level) for the isolates. The killing efficacy of the extracts was determined at various concentrations. Results: The zone diameter of inhibition (ZDI) obtained due to CIN, CLV and CMN ranged between 22-27 mm, 19-23 mm and 9-15 mm, respectively; while the MICs, for the isolates, were in the range of 64-256, 64-512 and 128-512 µg/ml, respectively. When tested for their MIC levels; the CIN and CLV were found to be bactericidal after 6 hrs of incubation, while CMN showed bactericidal activity after 24 hrs. However, when tested at various concentrations; CIN, CLV and CMN displayed bactericidal activity against S. aureus, after 24 hrs of incubation, at 200, 200 and 300 µg/ml, respectively. Conclusion: The C. zeylanicum and S. aromaticum showed the strongest in vitro antibacterial activity followed by C. cyminum against MRSA, and such findings could be considered a valuable support in the treatment of infection and may contribute to the development of potential antimicrobial agents for inclusion in anti- S. aureus regimens. Address correspondence and reprints request to: Abdullah Al-Mujaini, Department of Ophthalmology, Sultan Qaboos University, College of Medicine and Health Sciences, Sultanate of Oman. Department of Medicine, Sultan Qaboos, Hospital, Salalah, Sultanate of Oman. Address correspondence and reprints request to: Akhwand Shakeel Ahmad, Department of Medicine, Sultan Qaboos, Hospital, Salalah, Sultanate of Oman. Objectives: In 2009, cases of human infection with a novel influenza A (H1N1) virus were detected and soon reached a pandemic level. Presenting clinical features of this disease in Oman were observed and an attempt was made to identify features predicting the high risk of mortality. Methods: The clinical and laboratory features at the time of presentation in adult patients admitted with flu-like illness or pneumonia were studied who were later diagnosed as H1N1 infection by PCR of nasopharyngeal and/or throat swabs. Results: H1N1 infection mostly affected younger individuals who presented with fever and cough. One-third of the patients had rhinorrhea and a few had vomiting and diarrhea. Chest crepitations were common. Most of the patients had normal or low cell counts. The chest X-ray was normal in 23 (41.8%) cases, while in other cases pneumonia was detected characteristically starting from base and extending up. Almost half of the patients were either in frank or impending respiratory failure. Nine (16.4%) patients died. Conclusion: It is difficult to identify H1N1 influenza cases from other patients with a flu-like illness, but it can be strongly suspected when a patient presents with basal pneumonia, particularly if bilateral, with lymphocytopenia, and is hypoxemic, in the presence of other H1N1 infected cases in the community. These features are also indicative of severe illness with high mortality risk. *Internal Medicine Department, King Fahad Medical City, Riyadh, Saudi Arabia. +Medical Imaging Department, Medical College, King Saud University, Riyadh, Saudi Arabia. ++Research and Scientific Publication Center, King Fahad Medical City, Riyadh, Saudi Arabia. Address correspondence and reprints request to: Aref Abdulrahman Bin Abdulhak, Internal Medicine Department, King Fahad Medical City, Riyadh, Saudi Arabia. Transient osteoporosis of the hip (TOH) is a rare condition mainly affecting pregnant women in their third trimester and middle aged men. We report a case of TOH/Bone marrow edema syndrome in pregnancy with involvement of the surrounding soft tissues on magnetic resonance image, which has not been previously reported. The presence of such edema in the soft tissues may help to differentiate this condition from early avascular necrosis of the hip, and may also provide an insight into the pathogenesis of the condition. The reported patient was treated conservatively and fully recovered. Address correspondence and reprints request to: R.A.S.Kushwah, Department of Pulmonary Medicine, CSM Medical University, UP, Lucknow, India. Address correspondence and reprints request to: Ong Ping Seung, Department of Rheumatology, Hospital Raja Permaisuri Bainun, Malaysia. Adult-onset Still’s disease (AOSD) is a rare clinical entity with unknown etiology, characterized by arthritis, fever, evanescent rash and other systemic presentations. This report described a 45-year-old male who presented with sore throat, fever, arthritis, evanescent rash, raised liver enzymes and hyperferritinemia. He was diagnosed to have AOSD based on Yamuguchi criteria after the exclusion of other potential diagnoses. The patient partially responded to combined celecoxib and prednisolone. He was also prescribed methotrexate and his symptoms improved. 1Department of Pediatric Surgery, Hamad Medical Corporation, Doha, Qatar. 2Department of Pediatrics, Hamad Medical Corporation, Doha, Qatar. 3Department of Pathology, Hamad Medical Corporation, Doha, Qatar. Address correspondence and reprints request to: Tahir Abbas, Hamad Medical Corporation, Doha, Qatar. Solitary rectal ulcer syndrome is common in adults; however, it is thought to be rare in children. The etiology and exact pathogenesis of this condition are poorly understood. The main presenting feature of solitary rectal ulcer syndrome is rectal bleeding, but the clinical diagnosis and treatment remain challenging, particularly in pediatric patients. We present two pediatric patients with solitary rectal ulcer syndrome, who were treated surgically, and remain asymptomatic after the procedures. Clinicians should be aware of this problem in order to avoid delayed diagnosis and management.